(CBS) - Colorado police have arrested a 21-year-old man accused of shooting a foam deer in his home earlier this month, the Daily Camera reports. Cops say the shooter was drunk. We didn't think it was foam deer-hunting season just yet. Michael Lee, 21, was arrested in Boulder last Friday after a witness said a drunken Lee shot a foam deer with a revolver and then a shotgun, police reports say. He's charged with suspicion of illegal discharge of a firearm and using of a firearm while under the influence of alcohol. According to the witness, Lee was very intoxicated and insisted on showing off some of his guns, reports the Daily Camera. Lee then retrieved, and assembled, the foam deer. According to the newspaper, the witness told police Lee set up the "deer" in the house and fired at it from the yard with a revolver. 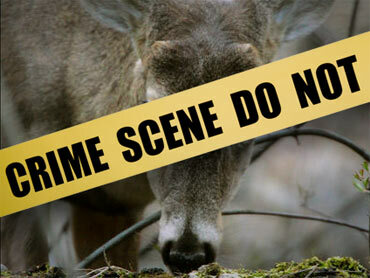 Lee then began using a shotgun on the "deer," at which point the witness left the house, according to police. Police say they later found the "deer," with shotgun pellets embedded in it, in a garage bin nearby, the Daily Camera reports. Lee also reportedly had several spent shotgun shells in his vehicle when he was arrested by police. The 21-year-old is free on $1,500 bond and is scheduled to appear in court Friday. Did we mention the "deer" was made of foam?